As one of the most well-known forms of electromagnetic radiation, microwaves are widely used both in industry and in the average consumer home. They are used to detect the speed of passing cars, to cure resins, and even to cook everyday foods in microwave ovens. This wide use of microwaves has led agencies like the U.S. Food and Drug Administration (FDA) to regulate tightly the manufacturing of microwave ovens since the 1970’s, and has even sparked significant research interest into microwave radiation and its effects on the human body. 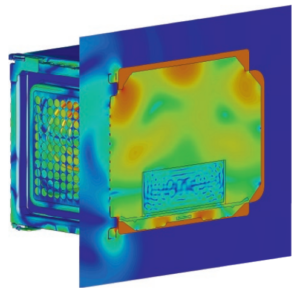 To meet these regulatory requirements and protect customers from excessive radiation, it is important to understand how the microwaves are being shielded, and this can be efficiently done with electromagnetic simulation software. Within a microwave oven, the electromagnetic field causing microwave heating can be used to dry, sterilize, and even cook. But outside a controlled environment, this electromagnetic radiation can be dangerous or even destructive. To prevent damage to other machinery or to the individuals operating them, it is important that microwave ovens be adequately shielded to prevent radiation leaks. In practice, there are several points of potential leakage for these ovens, where they need to be opened or seen into—namely doors and windows, which pose problems for radiation shielding. 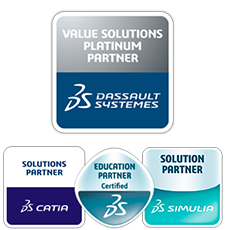 But there are also other points of leakage that are not easily identified by sensors or the naked eye, and this is where simulation software proves to be an important tool. By simulating electromagnetic radiation in closed and open systems, software can help identify where problems with shielding may occur, what levels of radiation are able to leak through, and can even help engineers determine whether or not their products are meeting the regulated microwave exposure limits. Once identified, sources of microwave leakage can be addressed using multiple shielding mechanisms. While simulation software may reveal that a microwave oven’s door may be its largest potential source of radiation leakage, with windows and seals that pose shielding problems, when constructed properly these doors can provide the greatest amount of shielding in the entire oven. Of course, engineers know that the seal around a door is never perfect, but multiple shielding mechanisms can be used to account for this imperfection. 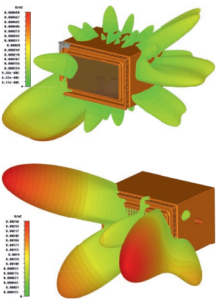 Using simulation software, mechanisms like window mesh and door fins can be optimized for minimal radiation leakage.